There are several of these on this block of Nicol. This pushes Ed Doty back a full 90 years before today. 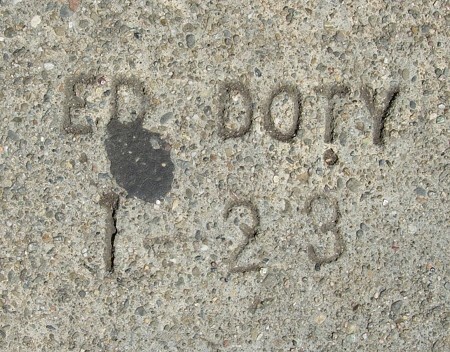 Not far away is another mark he left in 1944. A rare mark by the modest F. Roberts. This is my first example of a Rasmussen mark that’s clear enough to see the last letter, which is reversed. This pushes Riechel & Bredhoff back another year. 1923 – Reardon-Crist Construction Co.